Orthodox Church liturgical Subdeacon clergy vestments (claret-gold) by Istok Church Supplies Corp. 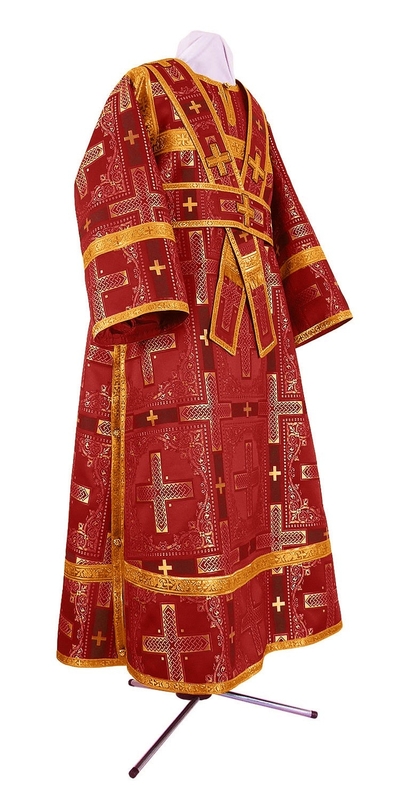 Discover the powerful allure of claret and gold combination with Istok Church Supplies exemplary collection of sub deacon vestments (Claret-Gold). Wear it on important occasions such as Crossover of our Lord or during the Lenten period to renew faith and spirituality. Our sub deacon vestments (Claret-Gold) are made with the choicest of liturgical fabrics namely rayon brocade and metallic brocade. If you are looking for sub-deacon vestments that look magnificent and last long, look no further than this collection. We provide each listed product as a complete set that comprises of two apparel items – the sticharion and orarion. These two clothing articles are the official vestments required for an Orthodox Christian sub deacon to carry out his liturgical duties. From the fabric to the decoration, we offer plenty of options for customers to personalize their order according to their budget, tastes and style of worship. All our vestments come with natural rayon lining for greater comfort and longevity. Customers can upgrade their order by adding natural velvet inserts to their order. We provide economy type decoration that includes simple crosses and inexpensive galloons by default. Customers who wish to upgrade can choose from either standard type decoration or premier type decoration both of which include high quality galloons and crosses. We take pride in offering made-to-measure sub deacon vestments (Claret-Gold). Our aim is to help all sub deacons procure quality vestments that fit perfectly so they can carry out duties without hindrance. We have a team of dedicated tailors in Europe who execute each and every order by hand to ensure impeccable results. We require a few short weeks for processing an order, so if you require your vestments in time for a special event, we request you place your order as soon as possible. With marked down prices and no extra taxes, our sub deacon vestments are quite a steal. We ship across USA, Europe, Canada and Australia. Happy browsing!